What Is the "APIC Audit Programme?" The "APIC Audit Programme" is a third party audit programme for auditing API manufacturers, distributors and API contract manufacturers and/or contract laboratories. It is the aim of the APIC Audit Programme to offer an independent and 'turnkey' GMP Compliance audit of API manufacturers and/or distributors, including organizing, conducting and evaluating the audit. An 'APIC Audit' within the framework of the APIC Audit Programme can be initiated by one or more QPs from one or different manufacturing authorisation holders in order to get independent information about the GMP compliance status about the API supplier, e.g. when preparing for authority inspections. It can also be initiated by an API manufacturer himself. Third Party Audit: A single customer (manufacturer of medicinal products) wants to audit the manufacturing site of his API supplier. 2-day audit performed by one auditor. Shared Audit: Several customers (manufacturers of medicinal products) want to audit the manufacturing site of their API supplier. 2-day audit performed by two auditors. The costs for the audit will be shared. Mock Inspection/Audit: An API manufacturer wants to know if the company meets the ICH Q7 requirements. The participation in the "APIC Audit Programme" is on a voluntary basis and not limited to members of APIC. Frequently asked questions and answers regarding the Third Party Audit programme can be found here. *The costs for travel and accommodation as well as for the audit report will be charged additionally. How Can GMP Audits Be Standardised? The audits are conducted on the basis of the EC GMP Guide Part II/ICH Q7 (Good Manufacturing Practice Guide for Active Pharmaceutical Ingredients) with regard to the APIC Auditing Guide. Will Third-Party Audits Be Accepted by the Authorities? An audit is an important tool for evaluating the GMP compliance status. A frequently asked question in connection with the APIC Audit Programme is whether a third Party audit will be accepted by the authorities. According to the draft Guidance on the occasions when it is appropriate for Competent Authorities to conduct inspections at the premises of Active Substances used as starting materials "it is expected that the holder of the manufacturing authorization will base such a declaration *) on carrying out, or having carried out on his behalf, an audit of the manufacturers/distributors of the active substances concerned." This clearly states that third party audits are being accepted. Similar third party programmes have already been established in other areas: ARC (Audit Repository Center), a PDA-associated company, offers auditing programmes for the audit of software suppliers, the IPEC (International Pharmaceutical Excipients Council) provides Third Party Auditing Programmes for excipient suppliers. With regard to the acceptance of Third Party Audits, IPEC member Irwin Silverstein said "lawyer with both industry and FDA experience have been involved in developing the program and (that) nobody has raised a concern that the third party audit would present more of a problem than having your own people do the same audit". (Gold Sheet, Vol 34, No. 1, January 2000). *) A declaration from the manufacturing authorization holder that the active substance(s) concerned has(have) been manufactured in accordance with the detailed guidelines on good manufacturing practice for starting material. Who Coordinates the API Audit Programme? The APIC Audit Programme is coordinated by the API Compliance Institute. 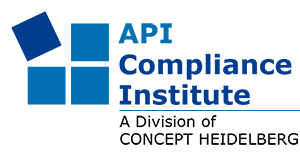 The API Compliance Institute was founded on 19 December 2002. The basis for the activities of the API Compliance Institute is constituted by a contractual agreement between APIC, a sector group of CEFIC, and the API Compliance Institute. It is the mission of the API Compliance Institute to standardize GMP audits of API manufacturers and to minimize the costs. For further information about the APIC Audit Programme, please download the brochure ( ) here. Genzyme Pharmaceuticals ( ) was among the first companies to participate in the APIC Audit Programme. The experience report can be found here. Please click here to contact us if you are interested in the Audit Scheme.